Assistant Produce Managers not only ensure that the customers visiting the store or department get an outstanding experience but also take charge of supervising and coordinating the departmental staff. 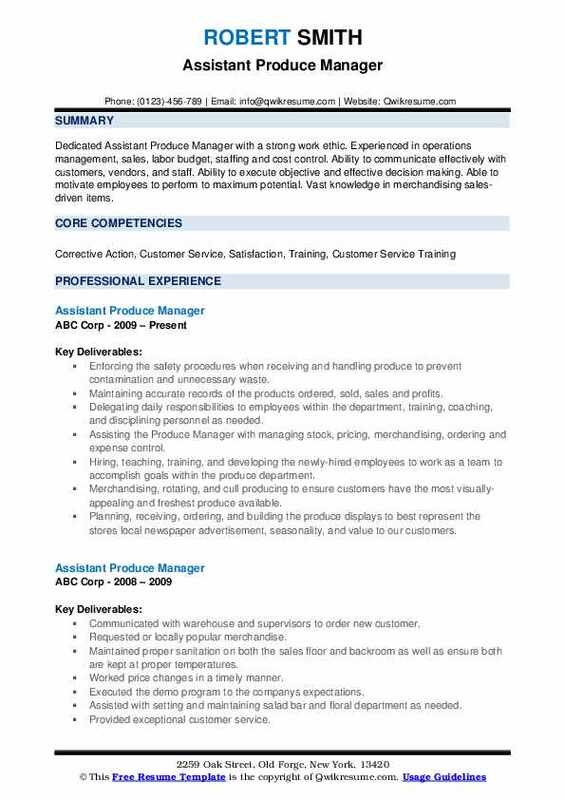 The following roles and responsibilities represent a portion of the Assistant Produce Manager Resume – ensuring all produce products meet the quality standards, addressing customer issues; managing product ordering, processing, merchandising and processing; managing daily work delegations, assisting in store operations and inventory records and assisting in hiring and recruiting new staff. 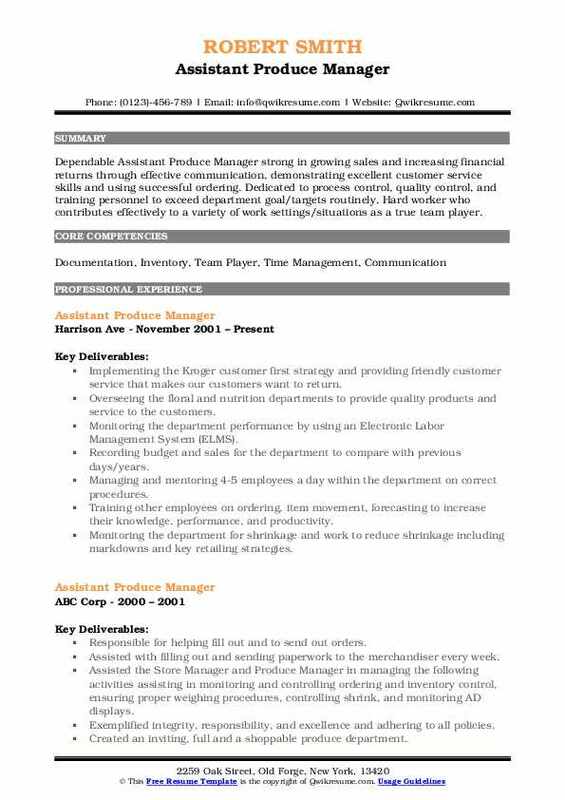 Some of the typical qualities commonly expected on the Assistant produce manager resume are sales orientation, problem-solving and leadership skills. These managers are expected to possess high reasoning and mathematical skills and fulfill the standard workload and physical demands too. Even though these professionals come from various educational backgrounds, it is mandatory that they embrace a high school diploma at the least. 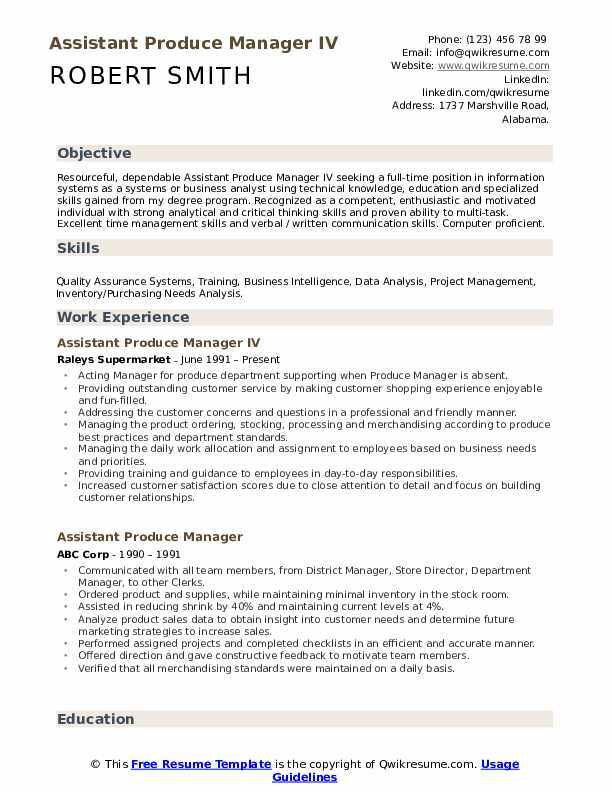 Summary : Resourceful, dependable Assistant Produce Manager IV seeking a full-time position in information systems as a systems or business analyst using technical knowledge, education and specialized skills gained from my degree program. Recognized as a competent, enthusiastic and motivated individual with strong analytical and critical thinking skills and proven ability to multi-task. Excellent time management skills and verbal / written communication skills. Computer proficient. 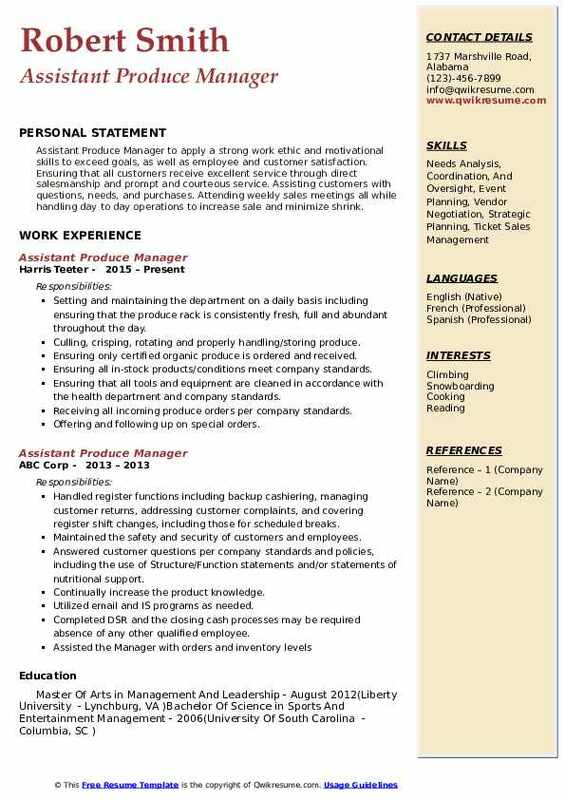 Skills : Quality Assurance Systems, Training, Business Intelligence, Data Analysis, Project Management, Inventory/Purchasing Needs Analysis. Acting Manager for produce department supporting when Produce Manager is absent. Providing outstanding customer service by making customer shopping experience enjoyable and fun-filled. Addressing the customer concerns and questions in a professional and friendly manner. Managing the product ordering, stocking, processing and merchandising according to produce best practices and department standards. Managing the daily work allocation and assignment to employees based on business needs and priorities. Providing training and guidance to employees in day-to-day responsibilities. Increased customer satisfaction scores due to close attention to detail and focus on building customer relationships. Won several Manager and customer service awards for treating customers respectively. Implemented corporate-driven initiatives to lower costs by reducing labor while maintaining customer satisfaction. 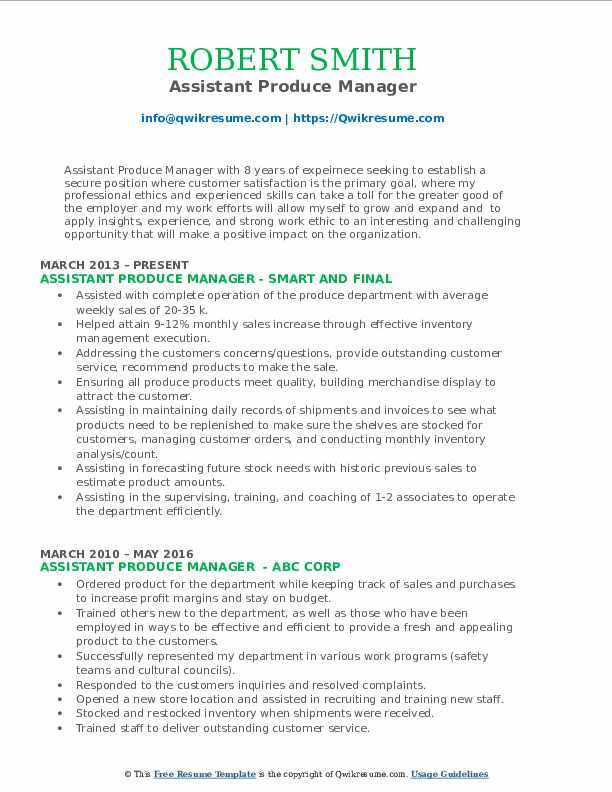 Summary : Dedicated Assistant Produce Manager with a strong work ethic. Experienced in operations management, sales, labor budget, staffing and cost control. Ability to communicate effectively with customers, vendors, and staff. Ability to execute objective and effective decision making. Able to motivate employees to perform to maximum potential. Vast knowledge in merchandising sales-driven items. Enforcing the safety procedures when receiving and handling produce to prevent contamination and unnecessary waste. Maintaining accurate records of the products ordered, sold, sales and profits. Delegating daily responsibilities to employees within the department, training, coaching, and disciplining personnel as needed. Assisting the Produce Manager with managing stock, pricing, merchandising, ordering and expense control. 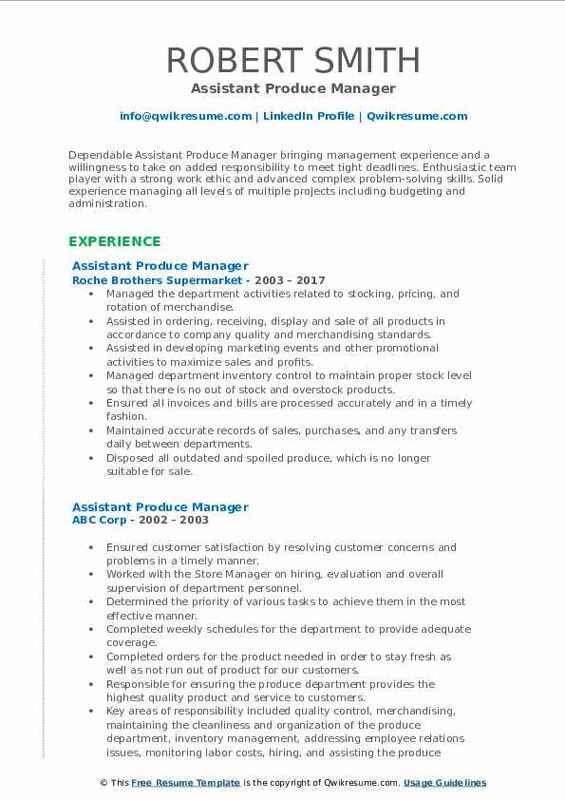 Hiring, teaching, training, and developing the newly-hired employees to work as a team to accomplish goals within the produce department. Merchandising, rotating, and cull producing to ensure customers have the most visually-appealing and freshest produce available. Planning, receiving, ordering, and building the produce displays to best represent the store's local newspaper advertisement, seasonality, and value to our customers. Ordering inventory and maintaining a proper inventory flow to sustain and/or increase profitability. 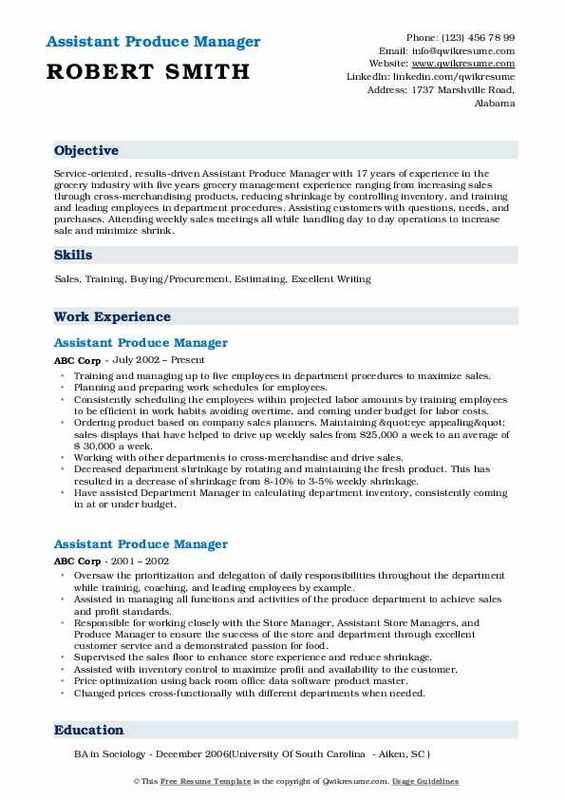 Summary : Reliable Assistant Produce Manager with strengths in inventory management, training, and customer service. Friendly, knowledgeable and hard-working team player. Provides customer service to the general public, followed food handlers guidelines. Assisted with the proper safety and display of the highest quality produce. Worked directly with the Produce Manager to achieve the highest standards. Managing the inventory daily by analyzing what products come in and using a checklist to ensure all products are in stock. Analyzing every item on invoice datasheet to make sure products are in stock. Analyzing and determining what products are out of stock, determine when special deals arrive and order products to create maximum profit for the company. Ordering products by planning and organizing what products are out of stock to determine the future product sales and generate revenue for the department. Reducing the product shrinkage and saving cost on produce department daily by recognizing products that have high demand and recognizing products with low demand. Analyzing the products that are received and make sure it is of high quality. Planning and organizing the building displays by drawing schematics to advertise products. Completing reports on products that have been shorted or not received and get credit for products from vendors. 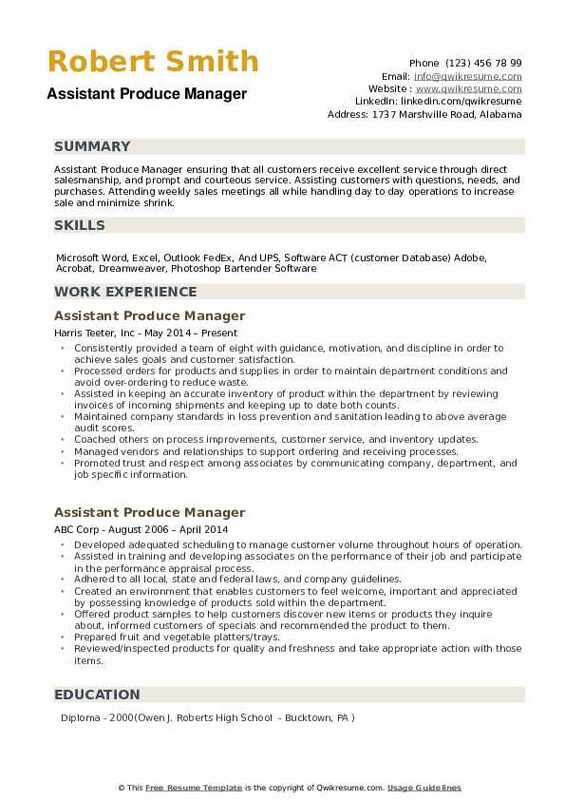 Summary : Dependable Assistant Produce Manager bringing management experience and a willingness to take on added responsibility to meet tight deadlines. Enthusiastic team player with a strong work ethic and advanced complex problem-solving skills. Solid experience managing all levels of multiple projects including budgeting and administration. Managed the department activities related to stocking, pricing, and rotation of merchandise. Assisted in ordering, receiving, display and sale of all products in accordance to company quality and merchandising standards. Assisted in developing marketing events and other promotional activities to maximize sales and profits. Managed department inventory control to maintain proper stock level so that there is no out of stock and overstock products. Ensured all invoices and bills are processed accurately and in a timely fashion. Maintained accurate records of sales, purchases, and any transfers daily between departments. Disposed all outdated and spoiled produce, which is no longer suitable for sale. Monitored and controlled all procurement costs and expenses according to the budget limit. Summary : Assistant Produce Manager with excellent Communication skills, verbal and written. Strong Managerial skills promoting and fostering a positive work environment. Ability to anticipate needs and potential problems and implement solutions. Takes initiative, self-directed, self-motivated and takes pride in the quality of the work. Experienced in the supervision of employees, creating schedules and ensuring customer satisfaction Multi-Tasker. Over 30 years of experience as a dedicated employee starting as a clerk and working my way up to management by demonstrating excellent leadership, dependability, and a strong work ethic. Provided excellent customer service and attracted many new repeat customers. Developed and maintained a team concept to improve associate morale, communication, and ultimately, working conditions. Complied with the company and government sanitation standards including temperature control. Established and maintained a working relationship with all support staff and supervisors. Adhered to company human resource and personnel policies as well as state and federal laws. Maintained an ongoing awareness of competitive activity in the immediate marketing area. Ensured proper usage compliance and handling of all supplies. Ensured proper maintenance and safe use of equipment. Summary : Service-oriented, results-driven Assistant Produce Manager with 17 years of experience in the grocery industry with five years grocery management experience ranging from increasing sales through cross-merchandising products, reducing shrinkage by controlling inventory, and training and leading employees in department procedures. Assisting customers with questions, needs, and purchases. Attending weekly sales meetings all while handling day to day operations to increase sale and minimize shrink. Training and managing up to five employees in department procedures to maximize sales. Planning and preparing work schedules for employees. Consistently scheduling the employees within projected labor amounts by training employees to be efficient in work habits avoiding overtime, and coming under budget for labor costs. Ordering product based on company sales planners. Maintaining "eye appealing" sales displays that have helped to drive up weekly sales from $25,000 a week to an average of $ 30,000 a week. Working with other departments to cross-merchandise and drive sales. Decreased department shrinkage by rotating and maintaining the fresh product. This has resulted in a decrease of shrinkage from 8-10% to 3-5% weekly shrinkage. Have assisted Department Manager in calculating department inventory, consistently coming in at or under budget. 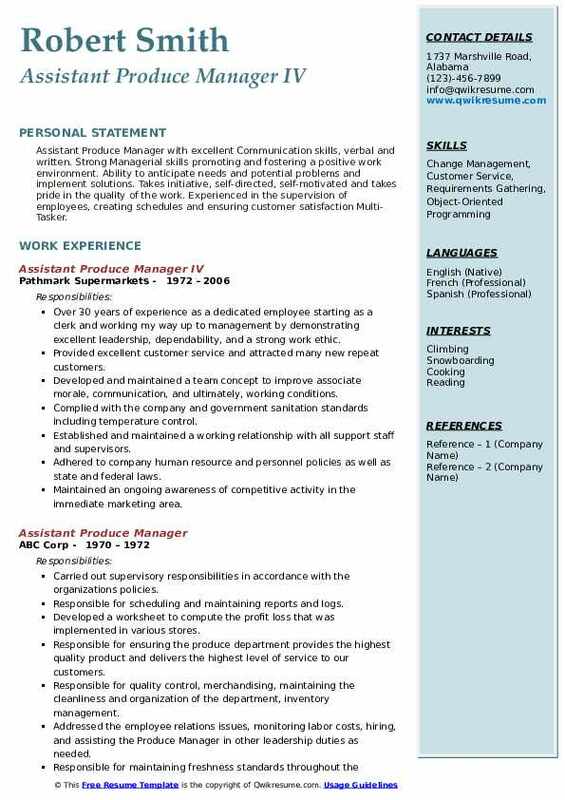 Summary : Assistant Produce Manager with 8 years of expeirnece seeking to establish a secure position where customer satisfaction is the primary goal, where my professional ethics and experienced skills can take a toll for the greater good of the employer and my work efforts will allow myself to grow and expand and to apply insights, experience, and strong work ethic to an interesting and challenging opportunity that will make a positive impact on the organization. Assisted with complete operation of the produce department with average weekly sales of 20-35 k.
Helped attain 9-12% monthly sales increase through effective inventory management execution. Addressing the customers concerns/questions, provide outstanding customer service, recommend products to make the sale. Ensuring all produce products meet quality, building merchandise display to attract the customer. Assisting in maintaining daily records of shipments and invoices to see what products need to be replenished to make sure the shelves are stocked for customers, managing customer orders, and conducting monthly inventory analysis/count. Assisting in forecasting future stock needs with historic previous sales to estimate product amounts. Assisting in the supervising, training, and coaching of 1-2 associates to operate the department efficiently. Summary : Dependable Assistant Produce Manager strong in growing sales and increasing financial returns through effective communication, demonstrating excellent customer service skills and using successful ordering. Dedicated to process control, quality control, and training personnel to exceed department goal/targets routinely. Hard worker who contributes effectively to a variety of work settings/situations as a true team player. Implementing the Kroger customer first strategy and providing friendly customer service that makes our customers want to return. Overseeing the floral and nutrition departments to provide quality products and service to the customers. Monitoring the department performance by using an Electronic Labor Management System (ELMS). Recording budget and sales for the department to compare with previous days/years. Managing and mentoring 4-5 employees a day within the department on correct procedures. Training other employees on ordering, item movement, forecasting to increase their knowledge, performance, and productivity. Monitoring the department for shrinkage and work to reduce shrinkage: including markdowns and key retailing strategies. 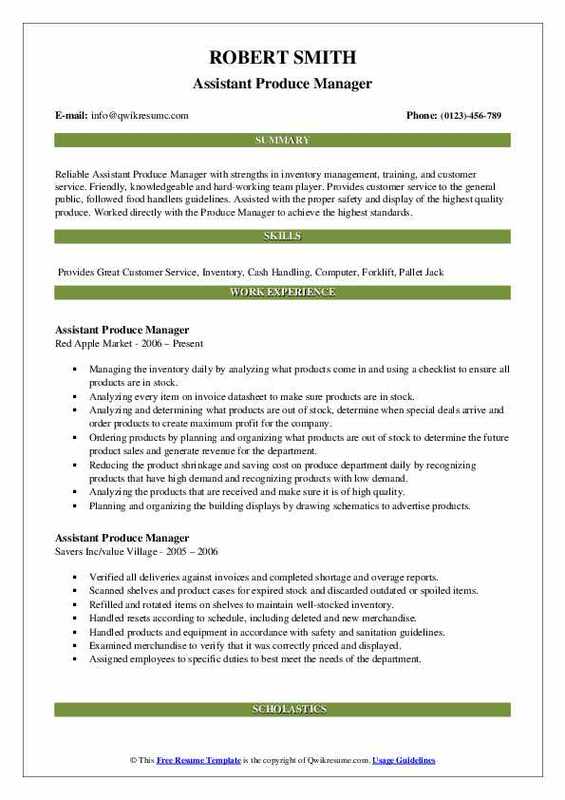 Objective : Assistant Produce Manager to apply a strong work ethic and motivational skills to exceed goals, as well as employee and customer satisfaction. Ensuring that all customers receive excellent service through direct salesmanship and prompt and courteous service. Assisting customers with questions, needs, and purchases. Attending weekly sales meetings all while handling day to day operations to increase sale and minimize shrink. Ensuring that all tools and equipment are cleaned in accordance with the health department and company standards. Summary : Assistant Produce Manager ensuring that all customers receive excellent service through direct salesmanship, and prompt and courteous service. Assisting customers with questions, needs, and purchases. Attending weekly sales meetings all while handling day to day operations to increase sale and minimize shrink. Consistently provided a team of eight with guidance, motivation, and discipline in order to achieve sales goals and customer satisfaction. Processed orders for products and supplies in order to maintain department conditions and avoid over-ordering to reduce waste. Assisted in keeping an accurate inventory of product within the department by reviewing invoices of incoming shipments and keeping up to date both counts. Maintained company standards in loss prevention and sanitation leading to above average audit scores. Coached others on process improvements, customer service, and inventory updates. Managed vendors and relationships to support ordering and receiving processes. Promoted trust and respect among associates by communicating company, department, and job specific information. Collaborated with associates and promote teamwork to help achieve company/store goals. Assisted with establishing performance goals for the department and empowering associates to meet/exceed targets.